Every second, countless bits of information are presented to us. While walking through a crowd, you suddenly hear a specific word and it prompts you to turn your head. You listen to a speech and realize you are counting the “um's” and “uh's.” You are told of a new vehicle and the next day you see it everywhere. Did the vehicle type suddenly appear? A scent triggers a memory of a long-ago event. You walk into a room and immediately notice risks; others don't. For efficiency purposes, throughout our life, our brain has been developed to filter out information deemed unnecessary and instead focus on a handful of critical details at any given time. The brain of a safety professional has been trained in a manner that facilitates the necessary recognition of risk. It is possible for others to benefit from this training as well. The portion of the brain that controls information filtering is called the reticular activating system (RAS). The RAS is an extremely critical system within the brain because it bridges the lower part (automatic functions like breathing) and upper part (where thoughts occur) of your brain. It is said to be the gateway between external stimuli and cognition. Figure 1 shows the location of the RAS within the brain. The RAS is defined as, “The part of the reticular formation in the brainstem that plays a central role in bodily and behavioral alertness. 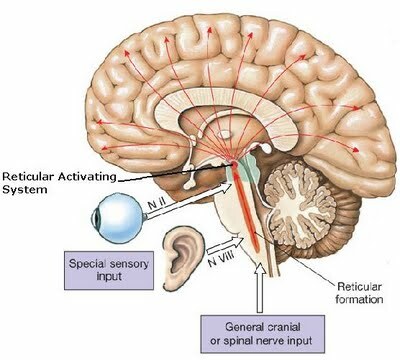 Its ascending connections affect the function of the cerebral cortex and its descending connections affect bodily posture and reflex mechanisms.” Simply put, the RAS is your awareness and arousal1 mechanism and the filter that controls what we experience throughout life. If properly leveraged, the RAS is the gateway to assisting others in their ability to recognize risk. Many safety professionals believe that new workers, when exposed to a new job or task, often are in a heightened state of awareness, purposely scanning for new risk. They will be more attuned to see hazards than experienced workers because they have not become experientially complacent to the daily associated risks in a task or job. Theoretically, this seems logical. Unfortunately, it is rarely true. If an individual has not yet trained their RAS to see the risks, those risks likely will not be recognized. What of experienced workers? How does risk complacency occur? Through work experience, what often gets filtered out in safety is low-probability risk, which is the opposite of common sense (highly probable) risk. If a risk has a one-in-a-thousand chance of turning into an incident, it has a low degree of probability. As a result, it easily can escape our focus, especially if safety is falsely defined and measured by the lack of accidents. After being exposed to risks multiple times without incurring an undesirable outcome, our brain, for efficiency purposes, tends to filter it out. Our perceptual thinking is tricked into believing we are safe; or worse, it generates a dangerous internal state of complacency, where someone feels secure but is unaware of potential dangers. Initial perceptions about risk often can change. What was perceived as a risk years ago might not create the same perception today. If we have trained our brains to perceive certain information as unnecessary and no longer risky and tune it out, are we unknowingly — subconsciously — contributing to our own risk exposure? When entering a room, the first thing we notice is what our brains have been trained to subconsciously scan for. Without realizing it, we experience what we intend to experience. We unknowingly have trained our brain's filter. The good news is we knowingly can retrain because this, by nature, is a continuous process. Karl Albrecht states in his book, Brain Power: Learn to Improve Your Thinking Skills, “That the RAS can be trained is clear. Mother will awake on hearing her baby while father sleeps on. Father, in the country, will awake when he hears the dog bark, but on a visit to town he soon learns to ignore a dog's bark while he is sleeping.”2 Similarly, how do you think about safety today compared to your first involvement in safety? Would it be fair to state that you now see things differently? You have, over time, retrained your RAS. This retraining can be achieved purposefully in a three-step approach. Rather than selecting a category of risks on which to focus (i.e., conditional, environmental, behavioral, organizational, procedural, etc. ), choose a few elements within the individual category. If the focused opportunity is not clear, consider establishing a master risk list by classifying types and subtypes of risks. Then perform a Pareto analysis of your incident data (regardless of severity) against the master list. This also ensures the retraining of the RAS is concentrated on transformational opportunities rather than opinions. The former has a greater chance in recognizing early return on investment than the latter. This is critical due to the motivational impact of early results. Lack of early wins causes people to question credibility of the approach, which negatively impacts the desired resulting sustainability. There are some learning styles that work better than others. Retraining should take into consideration these different learning styles. There are many popular approaches to determine the most efficient learning style for a particular situation. The most common is VARK Inventory (visual, auditory, reading/writing-preference and kinesthetic), developed by Neil D. Fleming. It determines an individual's preference for taking in — and putting out — information in a learning context.4 In addition, where possible, it facilitates the training to stimulate responses from the five senses. Rather than focusing on attempts to determine the dominant style of learning or sensory, consider leveraging all of them by making the learning experience as detailed, dynamic and multi-style stimulating as practically possible for the learner. This facilitates the RAS's ability to identify the targeted stimuli in their real-world settings. Identifying and communicating the targets to individuals might provide initial gains, yet fail to maintain those gains. Training only is as effective as the reinforcement that follows it. This old training principle points out the problem of most training initiatives: sustainability. The two most effective sustainability mechanisms in safety are habit and culture. It often is said, “Culture is why we do what we do.” Training can be forced upon someone; however, if it is not reinforced among peer groups through positive peer influence and organizational systems, it will not produce the desired results. If the culture is aligned to provide positive reinforcement during and immediately following the retraining of the RAS, it is more likely to result in the development of the new filter and thus, the new risk-identifying habits. To accomplish this, consider assessing your organization to identify both the formal and informal, on- and off-the-job communication channels available (i.e., safety meetings, safety committees, rumor mills, behavior-based safety observations, risk audits/inspections, safety walks, tailgate or toolbox sessions, etc.). There is a long-held theory in communication that states that to retain information, you must first hear it seven times. Determining and leveraging the many communication opportunities to embed the targeted RAS focus points ensures a multi-pronged approach. Lastly, it is critical to understand which formal and informal organizational systems (measurements, incentives, rewards and recognition, etc) will complement this training and which will create friction. Like any other change initiative, this positive change will not have a chance at success if your organizational systems work against it. Helping others to retrain their reticular activating system to better identify risks provides positive returns even outside of their occupational exposure. Subconsciously scanning for vehicle traffic prior to crossing a path is a childhood-learned response within the brain. This habit provides safety assistance to the adult individual in their occupational exposures. Similarly, helping individuals to better identify personal risk exposure is not limited to enhancing work safety. When individuals are able to better recognize risk, it influences their actions in their personal lives as well as their ability to offer safety guidance to their family members. Helping them to lead safer lives regardless of location is an honorable goal; yet, there is something in it for you, too. Training people to more effectively see risks reinforces and strengthens your risk-identification filter and leads your organization one step closer to safety culture excellence. Shawn M. Galloway is the president of ProAct Safety, an international safety excellence consulting firm. As an author, speaker and expert business-safety strategist, he has assisted hundreds of organizations to achieve and sustain excellence in safety, culture and operational performance. Galloway also is the host of the weekly podcast series, Safety Culture Excellence. He can be reached at 936-273-8700 or [email protected].